This is an incredibly easy and simple dish to put together. It’s really quick to change up with what you have in your fridge or cupboards and it tastes really delicious! It’s a great way to up your serving of veggies into your day as well. I love to make this for lunch; it really keeps me going during the day and helps you to avoid feeling sluggish come the afternoon. 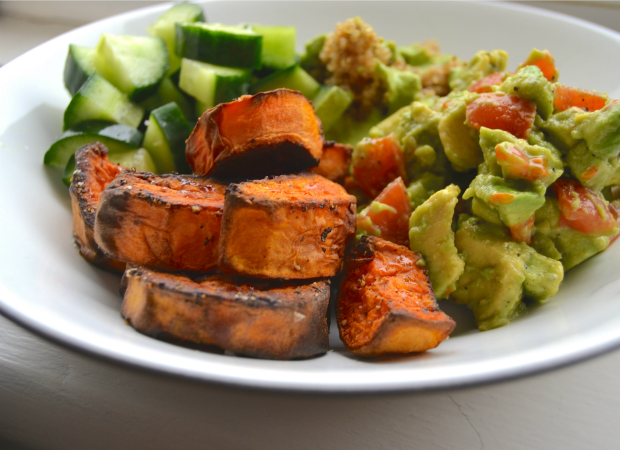 This version has a quick guacamole, roasted sweet potato, crispy cucumber, and quinoa with a fresh herb dressing. My favourite thing to add to this is a handful of roasted chickpeas. Preheat oven to 350°F. Add a knob of coconut oil to a baking tray and allow to melt in the oven. Peel the sweet potato (unless it’s organic, then leave the skin on) and chop into cubes. Add to the melted coconut oil and season with salt and pepper. Bake for about 20 minutes. Rinse the quinoa well and add to a saucepan with the water or veggie stock. Bring to a boil, then simmer for about 12-15 minutes. Don’t constantly stir, the quinoa cooks best when it’s left on its own so all is cooked evenly. Scoop the flesh from the avocado and add to a small bowl and mash. Dice the tomatoes and add to the bowl. Add lemon or lime juice and salt and pepper to taste. Chop the cucumber into bite size pieces and set aside then make your herb dressing by adding the various herbs to a blender along with olive oil, the juice of a lemon, and a little water as needed. Blend the dressing until you have a consistency you like. Assemble the bowl: Remove the sweet potato from the oven and add to the bowl. Add the quinoa, the guacamole, and the chopped cucumber, and then finish everything off with a drizzling of the herb dressing. This recipe is sort of between a curry and a stew but it somehow feels a little lighter while still full of hearty flavour. When curry comes to mind, I often think of a cozy, warming winter dish. However, it’s become a staple of mine throughout the year as it’s really easy to change up and suit to what you like. Plus there are so many flavours and textures to experiment with. It’s also a great way to use up any veggies you have. What I really love about this dish is adding the chilli in whole. It softens while everything simmers and the seeds “melt” into the dish leaving a subtle heat distributed throughout. In a large casserole pot, add the coconut oil to melt over a low-medium heat. If using onions, finely chop and add to the pot. Mince the garlic, grate the ginger and add, along with the spices. Chop the stalks of the fresh coriander and add them as well. Chop your carrots and sweet potato and add them to the pot allowing them to soften for about 5 minutes. Then add the rinsed lentils, coconut milk, water, and the whole chilli. Bring everything to a boil, then turn the heat down, pop the lid on, and let everything gently simmer for 35-45 minutes. Give it a stir every once in a while and add more water as needed. Lightly toast the almonds/pumpkin seeds in a frying pan until golden. When ready to serve, remove the chilli from the pot. Taste to season, add the zest and juice of the lime, the toasted nuts/seeds, and a sprinkling of fresh coriander. This is a really simple dish to put together, layered with lots of delicious flavours. 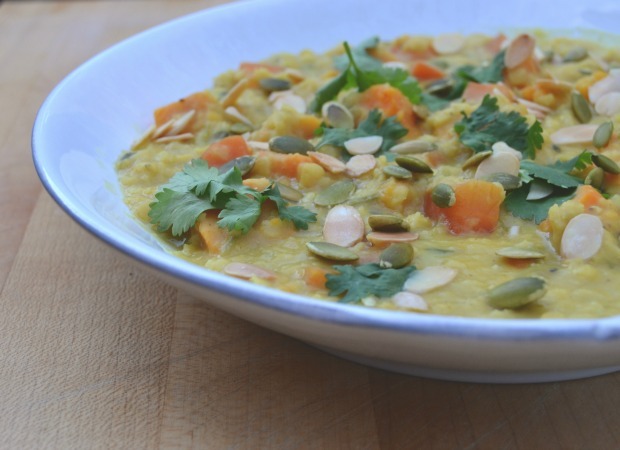 It fills you up for dinner and is perfect for a leftover lunch the next day. 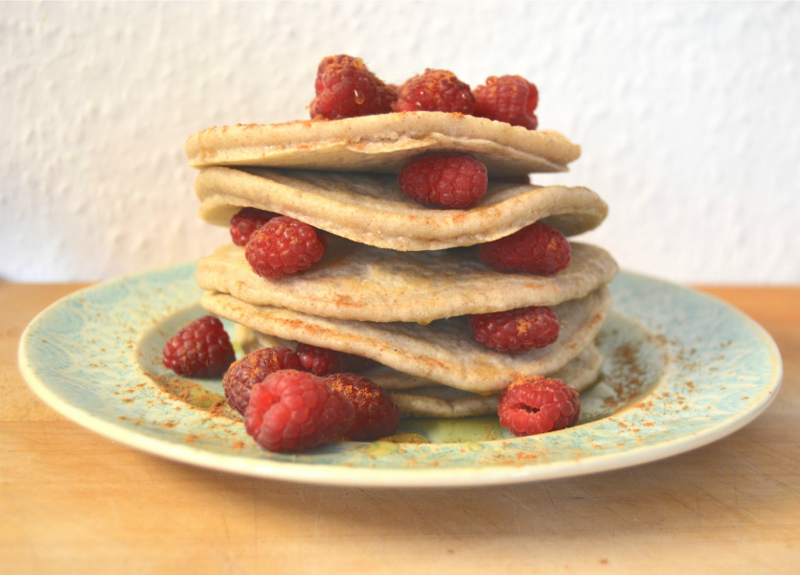 Shrove Tuesday or Pancake Day although not a typical holiday per say has always been a favourite of mine. I’m not sure if that’s because pancakes were the first thing I learned to make, or that they’re really versatile to play with and quick to make, or because I have always loved them! With the day fast approaching (it falls on February 17th this year- make note!) I altered my usual recipe to be gluten free and dairy free but still healthy and yummy to enjoy breakfast, lunch, and dinner! (Am I the only one who does that?) It was such a treat to have them all day long as a kid! This is a basic recipe that makes approximately 6 pancakes. You can double the recipe for more servings and you can add in some extra ingredients to what you fancy. A tablespoon of raw cacao makes for chocolate ones or fruit like apples and blueberries make great options. Of course, being Canadian, enjoying them as they are with some maple syrup is one of the best ways I’ll say you can enjoy them! 1. In a large bowl, add the egg and milk. Whisk together until light and foamy. Add the vanilla. 2. Melt the coconut oil on the stove top then slowly stream into the mix, whisking as you go along. 4. Heat a frying pan on low-medium heat and melt a teaspoon of coconut oil, making sure to coat the whole pan. When it’s ready, take about 1/8 cup of batter and pour into the pan. 5. Allow the pancakes a minute or two to cook. You’ll know it’s ready to flip with bubbles begin to appear and pop on the surface of the pancake. Flip to the other side and allow another minute or so to cook. 6. Complete with the rest of the batter. Add coconut oil or organic butter and some maple syrup, fruit, nuts, a sprinkle of cinnamon or raw cacao. Enjoy these as you will- they’re so quick and easy to make and you can really play with the flavours. I’ve made them gluten free, dairy free, and refined sugar free however you can substitute organic dairy milk or other types of flour. You’ll find yourself making them more often than not after you try them once. Happy Pancake Day!